On 21st April Google will roll out an algorithm update that has the potential to affect search engine rankings more than Google Panda ever did. Google Panda affected thousands of businesses who lost high ranking positions and consigned them to the lower bowels of Google, somewhere like page 17 – or worse – some websites were even blacklisted. Many never recovered their rankings and SEO companies who, in many cases, created the low quality inbound links stopped taking phone calls, some even disappeared overnight. Now Google are not suggesting that websites will be blacklisted for not being mobile friendly – but they will be penalised. Over the past few weeks Google Webmasters have had notifications arriving warning them of sites not being mobile friendly. They have posted this article explaining their thinking and what they want webmasters to do. It is quite clear that they are highly focused on mobile-friendly content. If your site was built over 2-3 years ago it won’t necessarily be mobile friendly. The parameters for web design and user experience are evolving so rapidly that it probably wasn’t considered. That is no longer the case and business owners ignore these warnings at your peril. We won’t know the full effects of the algorithm update until it is applied to it is being referred to in some quarters as ‘Mobilegeddon’. 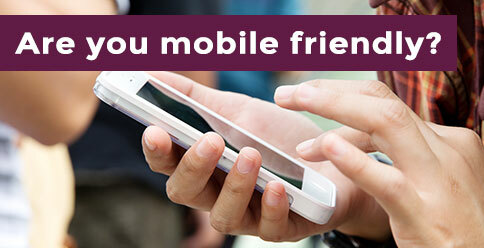 If you are concerned about making sure your website is mobile friendly, get in touch. You can call us on 01527 517309 or email us via the contact form. Good graphic design projects achieve the perfect balance between colour, typography and composition. At Blackberry, we understand this and always give you the best visualisation of your ideas. We offer web design that engages your target audience. Blackberry creates effective web design for different styles of website including brochureware, cms, dynamic and eCommerce. We help our clients build strong brands that can create loyalty and add value. We ensure you communicate your message and project your core brand values. We have the creative expertise to deliver.